An updated MindMap available here. It took some time to update the CISO MindMap but finally it is here. Thanks to all who provided suggestions for this update. A very rapid change is happening across the industries. Whether it is digital transformation, Internet of Things (IoT), Software Defined Networking (SDN), crypto currencies, virtual reality, 3D printing or others, change is visible everywhere. These changes are happening across all industries. CISOs not only need to adapt quickly to these changes but need to be on the leading edge of these changes. Business enablement is becoming a key role of modern CISOs. Good luck with all of this! UPDATE: If you are want to hang a printed copy of this mind map in your office, I would suggest using the CISO MindMap_a0 PDF and getting a 24×36 inch print from OfficeMax or some other place. A related post to this mind map is about building a security operations center or SOC. Please refer to “What is Takes to Build a SOC“. 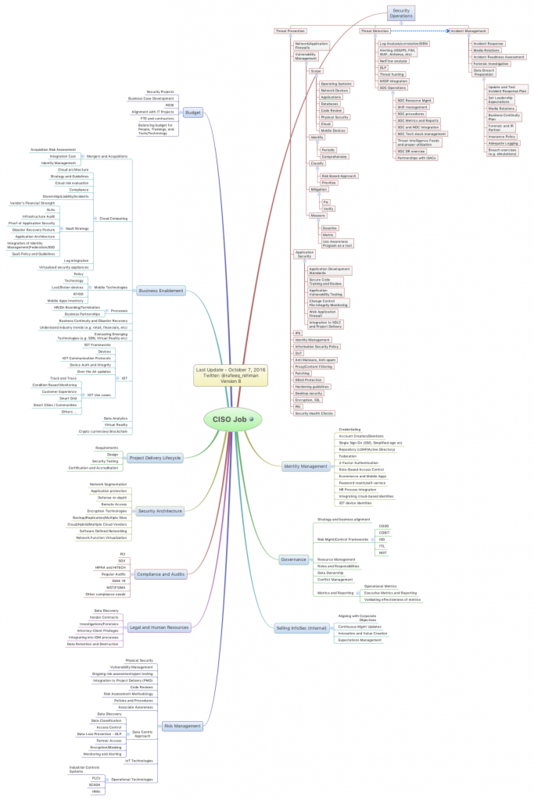 PDF versions of CISO mind map are available for download using the following links. This entry was posted in InfoSec, IoT, Leadership and tagged ciso, infosec, IoT, MindMap, SOC. Bookmark the permalink.